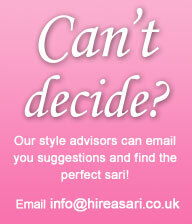 Does Hire a Sari have a physical shop? No, we are purely an online rental boutique. We have offices based in Leicester but not a shop. All products are delivered straight to you. Do you send details on how to wear a sari? Yes, we send a step by step guide on how to wear a sari with all of our orders, it’s easy! Can we tailor blouses and outfits to fit? How long can I hire the outfit for? The hire period is from the date which the outfit is received by the customer and you have the outfit for 7 days. The outfit must be returned to the Company no later than 7 days from the date in which the outfit is received. Can we buy items from hireasari.co.uk? Yes of course you can, please contact info@hireasari which item you would like to purchase. Can I ask for style advice or ask questions about specific outfits before I order? Yes of course, if you need some help choosing the perfect outfit for you or just want advice on colours and sizes just give us a call or email us on info@hireasari.co.uk. One of our style advisers will be happy to help! What payment methods does Hire a Sari take? What happens if I notice my personal details are incorrect after completing the ordering process? After receiving the confirmation order from us, if you realise your personal details are incorrect please email us at info@hireasari.co.uk , ensuring you include your order number. Yes however this is subject to availability. Yes a signature will be required on delivery, however you can have a neighbour or anybody sign on your behalf it does not have to be the customer. Not at present, delivery is restricted to England, Scotland & Wales only, but hopefully we will one day! Don't worry! We understand that some wear and tear may be inevitable and beyond your control. If you damage the dress the first thing you should do is to inform us by sending an e-mail to info@hireasari.co.uk . We reserve the right to handle each incident on a per case basis. Our dry cleaner and seamstress can take care of most minor damage. Any damage will be looked into before informing you of any required next steps or payments required. We have the right to charge for any damage that causes the outfits to become un hireable. Save money by resisting the urge to accumulate a closet full of items that cost a fortune - but are quickly outdated. 2. Choose from our exclusive range of outfits from the comfort of your home without having to travel to India or major shopping streets around the country. 3. It’s an easy and convenient way to shop, and hassle free. 4. Get style advice and the option to BUY if you like the outfit so much!